The Low District lies south of the Grand Canal and is home to the poor. The city is surrounded by a 40' tall, 25' thick curtain wall and patrolled by sentries at all times. The gate is an immense stone affair with numerous portcullis, murder holes, and wards. The South Gate is on the southeast wall and leads into the Sprawl. Magic Practitioner Registry: 250 gold (a pass is provided to gain entry to the High District). Psionics Registry: 150 gold (a pass is provided to gain entry to the High District). Residents of Llorn are not required to pay the entrance tax. The group sees the watch fires atop the South Gate long before they see the city walls themselves such is the dark of night. Finally, upon arrival, the group is hailed by the watch themselves. Once identified, the guards open the gate wide enough to allow the group to pass through the gates. The gates are quickly shut behind them. Orc 7 is alive, unarmed, and bound & gagged. Fox treats the Orc so he will be in shape to travel. We make our way to the city through the dark night, barely avoiding trouble more than once. It has been a long time since Fox has had to do any lengthy treks like this without resting, but he is determined not to seem weak. With the loss of the Gnome he is now the one that the others are likely to think weakest. This, despite the fact that he killed as many Orcs as any of them and more that most. That magic bow of his is amazing. When we reach town, he greets the Guard, "Fox the Healer and company, returning from our first Orc hunt, we have ears and a captive for questioning. We also have one dead party member and a number who are hurt to various degrees." He, for one, will be glad to rest. So much fighting followed by so much healing with his mind magic followed by the trek back has him dead on his feet. He wonders, now where do we go to find out about the fort the Orcs have appropriated? As Trask approaches the gates, he looks to the nightwatch. "Got one of your Orc raiders for the noose." Trask says giving the rope a yank. "So would you like to take him off our hands or do I need to drag him somewhere before I can seek healing?" Trask asks with the kind of authority he is use to using in the Red Brigade. If they want the Orc, Trask gladly hands the animal over, if not Trask leads the orc to wherever he's told to take him. Before Trask leaves from the group. "First I would like to take Jakken to the mortuary for burial, the least i can do for a brother. I'm also going to make my way to the church and get healing. I then think I will come back to the inn for rest." Trask says bruskly. Trask will make his way to the Temple District, to get Jakken's body dealt with, before looking to get healed of his wounds. Once this has happened, Trask will head back to the inn and pass out for several hours. The next day he will hopefully meet up with the others to discuss their next step. Trask will also go shopping, but I will hold off on that list until I know what others are up to. Tatyana relaxes a little as the group approaches the South Gate, still annoyed with herself for the few blunders that where narrowly averted on the way back to the City. The proud female Wolfen stands up straight and tall as they enter the light of the city, determined to let no one see the exhaustion in her body show. Once inside the walls, she is torn between wanting to see the gnomes remains are treated properly and to see that they are paid for the ears that they all found so hard for. In the end the payment wins out, "I'll take the ears and see we get paid." to herself she thinks, Jakkin would agree, the coin is worth more now, since he is beyond help. Tatyana will take the ears wherever she is instructed to for payment and puts the coin securely inside her breastplate, once that's done, she heads back to where they are staying. The walk back is mostly filled with her agreeing with herself about having a bath or just going to bed. If she sees any of the group that stayed in the city, she will give a simply account of the trials and tribulations of their ill-fated excursion. She'll then lock herself in her room, check her hidden money, place the payment money under her pillow and disrobe. Giving a good shake of her entire body to loosen the fur, the Undead hunter will fall into the bed and to sleep. I'll go shopping in the morning, she thinks to herself before slipping into the sweet abyss of sleep. Last edited by Tatyana Singh on Tue Mar 12, 2019 2:59 pm, edited 1 time in total. The city watch take very rough custody of the prisoner. Trask and his colleagues have a nagging sense of doubt that the orc will survive to its destination. Trask is singled out as the assumed leader, ears are counted (11), and a small coin purse of 1,100 gold is traded for the ears. While Fox thinks it is unwise to leave the Orc in the hands of those who likely will not appreciate him as an information source, he realizes there is not all that much he can do about it. The guards barely recognize him at Tatyana as not enemies, they are unlikely to listen to advice from us, no matter how good that advice is. Fox notes that 1100 gold is not going to be enough to pay a temple for proper healing, for those who seek magical aid. Fortunately he can heal himself, and aid his allies to heal, but it will likely still be a long time before everyone is healthy enough to head out again...likely no sooner than a week without magical help. He says to the others, "We need to rest and heal, to get our armor mended as well. We need to research to find the fortress they are using. We should find our other allies. We need to properly honor Jakkin. We need to outfit for a trip to the enemy fortress. What else?" Conditions: Healing (via Fox); recovers 4 H.P./day for the first two days and 8 H.P./day for three more days. Exhausted; -1/2 all combat stats. Thorgim grins sheepishly and looks side-to-side to see if any of his other ‘warrior’ companions that Fox’s statement to the guards was amusing. I didn’t know we were Fox’s assisting troupe? Ha! Fox-the-healer-and-company indeed! Thorgrim leans back in his saddle and nods in interest towards Trask. ”Not sure what ‘church’ you’re talking about my old friend, but would I be able to get the same service? Can I afford it? My bones and joints still ache from that last fight... not feeling 100 percent quite just yet, y’know? I most certainly agree with getting some rest. Back to the Inn of the guild, or the Weary Journeyman? The barbarian warrior is quite content to lay in a pile of hay, but will insist that they all have a common place to link-back-up after running any required errands. Trask listens to Fox literally repeat half of the information he just said himself and promptly begins to ignore the canine. Thorgrim wrote: Thorgrim leans back in his saddle and nods in interest towards Trask. ”Not sure what ‘church’ you’re talking about my old friend, but would I be able to get the same service? Can I afford it? My bones and joints still ache from that last fight... not feeling 100 percent quite just yet, y’know? I most certainly agree with getting some rest. Back to the Inn of the guild, or the Weary Journeyman? Trask nods to the barbarian. "I'm certain if you have the coin they will provide the same healing they give to all." Trask says thinking of how much this endeavor is going to set him back. "I'm actually thinking the Weary Journeyman. They have nice accommodations." Trasks says as he quickly makes a quick check that Jakin's corpse is secured to Garrick. Trask nods. "He does good work, I need another throwing knife I think." Trask says looking to his one empty knife sheath. Trask makes his way into the city, exhausted as he is. Fox lays out the group's challenges, and they have a short chat about it while being paid for the ears. First and foremost on their itinerary is laying the dead to rest despite their exhaustion, then they could look after their own needs. Trask leads the way to the mortuary, gets the little warrior his proper rites, then the four of them return to their rooms at the pier where they slowly strip themselves of their blood-soaked armor, and soiled travel clothes, and each beds down for a long, recuperative sleep. The four awaken from their exhausted stupors, hungry, dirty, and sore, but rested. Trask feels a little weak from his blood loss and injuries, and knows he needs healing, but is otherwise feeling much better and more clear-headed. Tatyana, other than being ravenous, feels fine, if a bit stiff from the extensive forced march. Fox feels as though he's recuperating quite well, he's just a bit sore from the fight, but Thorgrim, while not feeling weak from blood loss like Trask, feels as though he's been trampled by a team of oxen such is the extent of his injuries. Trask: -57 S.D.C., -12 H.P. Fox: -10 S.D.C. ; -40 I.S.P. Thorgrim: -54 S.D.C. to Scale Mail; -110 S.D.C. Fox is going to seek out information, we were told the Orcs lair...if the Orc was honest. He wants to find out if the place described exists. Not having much skill at seeking information, he will fo to the Healer he stayed with when he arrived and ask him where he should seek for information. If he has time, he will meditate for 6 hours to regain ISP, and if Trask and Thorgrim need it he will continue to aid their healing. Conditions: Recovers 4 H.P./day for one more day, and 8 H.P./day for three more days. Thorgrim seems to strain and stretch out a bit with every movement, his muscles unwinding like tightly wound cording. 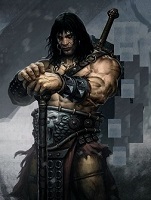 The barbarian warrior dons his Leather of Iron -Now that feels NICE and LIGHT by comparison- gathers his backpack, to include his damaged scale mail, weapons and walks to the Inn’s common dining area - his stomach groaning for fuel. By the ancients, let there be a decent meal ready! He pulls out a chair and leans back into it, his joints aching as much as the chair’s with his mass testing it’s strength. Thor hails a servant, ”I’ll take whatever may be ready to eat, now I’m not picky, just hungry. I’ll take it, oh, and lots of it. You’ll have my thanks and of course my gold... and if the gods favor us both, perhaps you’ve got a cold pitcher of ale for me too to earn a 2 gold piece tip.” Thor will wolf down the meal as soon as it is presented satiating his hunger and thirst. He tries to make conversation wit the servant around his first mouthful, ”Fine service! Do you know your way around the Temple District? What church offers healing services at a fair price? Any idea?” Thor will make a mental note of the response given. Sipping the last of his drink Thor reviews his tasks ahead of him for the day. Food and drink; check. Still sore, bruised and pained; visit church. Armor and weapons; Goldenbeard’s place. Information on our next Orcish objective; Thoran may also know something, methinks. More food and drink; hmmm best not to be out all day. I’ll finish my tasks then head back here, perhaps I can catch up with my companions then... wait till Tyral here’s about the mess we’ve been through, he’d scoff around a flute of wine, haha. As long as Thorgrim didn’t recieve a rancid, foul, skimpy meal OR a vegetarian salad Belimar’s balls! Help the poor soul who would dare serve Thorgrim the mighty a salad for a hearty meal!... Thorgrim will share a generous 5 gold tip with the servant, and asks a favor of them, albeit backed with gold. Thor will then step off for the temple district to begin his in Llorn. The meal is plentiful given the coin he pays, but not of good quality; much the same fare as the previous day when last he ate. However, with the five gold service fee, he finds the server to be more than accommodating to his wishes and agreeable to his request.